Dale Montgomery explains how to teach your pup to get behind the stock and drive them forward. Click here to read more! A wealth of good ideas, tips and considerations before you head out on a trip of a lifetime. 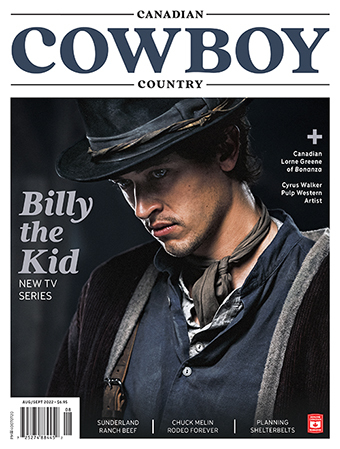 You can read the whole article in the August/September 2015 issue of Canadian Cowboy Country magazine. To subscribe, click here or call Kendra at 1-800-943-7336. Hall of Fame artist Jay Contway and his wife Lynn have welcomed a wealth of friends, family and art collectors into their stunning home. Click here to read more! This two-time World Champion bronco and trick-riding Canadian cowgirl is in two Halls of Fame—both in the U.S.
Profiles on competitors, rough stock and rodeo committees all making their mark on the pro rodeo trail. An interview with Greg Cassidy, the patriarch of one of pro rodeo’s leading family dynasties and the amazing horses that helped them. Click here to read more! Let us ride together! Click here to read more!